Mountain Heritage put up two quick runs Tuesday on its side of the scoreboard at The Bottoms, two runs that looked lonely on that display by the end of the evening. Runs flowed freely on Polk County’s side of the ledger, the Wolverines scoring in every inning en route to an 18-2 Western Highlands Conference victory in five innings. The Wolverines (5-2, 4-0) racked up 14 hits and took advantage of four Mountain Heritage errors plus seven walks and three hit batsmen. Polk answered Mountain Heritage’s 2-0 lead with two runs of its own in the bottom of the first as Clark Phipps tripled with one out and scored on Nick Capozzi’s single. Capozzi stole second, moved to third on Sedrick Pickett’s bloop single and scored on a balk to make it 2-2. The Wolverines took the lead in the bottom of the second with two more runs as Kyler Scruggs reached on an error and Zeke Herrman walked. With two outs, Capozzi then hammered a drive to center for a triple that brought in both runners and made it a 4-2 Polk lead. An error on a Pickett fly ball to left allowed Capozzi to score. Five more runs scored in the bottom of the third. Grayson Jones singled to open the inning and later scored on a Scruggs’ single. A walk to Herrmann and Evan Rimer’s hit by pitch loaded the bases, with Phipps the singling to left to plate Scruggs and Herrmann. Rimer later scored on a Mountain Heritage error, with Phipps scoring on an infield grounder to make it 10-2. 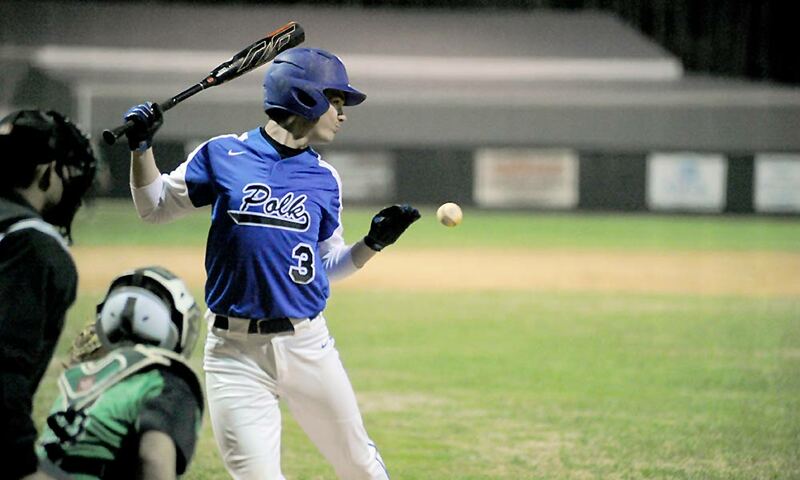 Polk County then exploded for eight runs in the bottom of the fourth, all with two outs. Phipps had an RBI double and Eljah Sutton had a two-run double to highlight the inning. Capozzi finished 3-for-4 with four RBI and three runs to lead Polk County, with Phipps going 3-for-4 with three RBI and four runs. Jones was 2-for-3 with an RBI and scored twice, with Rimer, Pickett, Kropp, Sutton, Scruggs and Jordan Bishop each adding a hit. Avery Edwards earned the win, striking out seven and allowing three hits in four innings. Austin Geagley pitched the fifth, striking out one and allowing a hit. The Wolverines continue conference play on Friday, hosting Madison.